"Formation" is a song recorded by American singer Beyoncé for her sixth studio album Lemonade (2016). It was written by Khalif Brown, Asheton Hogan, Mike Will Made It and Beyoncé and produced by the latter three. It served as the album's lead single, released on February 6, 2016 through Parkwood Entertainment. The song's accompanying music video, directed by Melina Matsoukas, premiered on the same day as the song itself through Beyoncé's official YouTube account. It received mixed response for its alleged anti-police stance, which the singer denied, in addition to controversy over documentary footage used in the video. However, some critics praised its depiction of African-Americans not frequently seen in mainstream media. In order to promote the song, Beyoncé performed it during her guest appearance at the Super Bowl 50 halftime show the day after its premiere. Throughout 2016, Beyoncé launched her The Formation World Tour which was named in reference to the song. "Formation" was Google's most searched song of 2016. "Formation" was nominated for the Grammy Awards: Record of the Year, Song of the Year, and won in the category Best Music Video, and was included on several year-end lists. "Formation" was written by Khalif "Swae Lee" Brown, Asheton Hogan, Mike Will Made It and Beyoncé while its production was handled by the latter two alongside Pluss as a co-producer. "Formation" was released on February 6, 2016, accompanied by its official music video. It was released in a similar manner to Beyoncé's 2013 self-titled studio album without any previous announcements, leading its release to be dubbed as a "surprise release" by media outlets. The song was made available for free download exclusively via the subscription-based music streaming service Tidal. The release of the song was also followed by new merchandise through the singer's website with items and clothings citing lyrics from the song. Formation contains strong political criticism in its lyrics, being described by Los Angeles Times's Mikael Wood as "a statement of radical black positivity." It also was noted by Joseph Lamour who commented during a review for MTV that Formation is "a song whose lyrics are teeming with notions of empowerment and pride in her heritage as a black American with roots in Alabama and Louisiana." The song opens with rumbling sirens, in the opening lines, "Y'all haters corny with that Illuminati mess," the song addresses rumors about the singer's connection to popular conspiracy theories about the Illuminati. This synth effect appears as Beyoncé repeats the first verse "My daddy Alabama/ Momma Louisiana", NPR's Mandalit del Barco noted during the verse, Beyoncé represents her family roots, he said, "Her mother is from Louisiana, as she let us know in the song. This has always been a big part of her identity; it's not one that the mainstream focus is on. People talk about her not centering it." He also described the lines as an "unapologetic blackness." The Guardian's Alex Macpherson wrote the song "musically transpires '7/11'". The song is written in the key of F minor in common time with a tempo of 123 beats per minute. Beyoncé's vocals span from D3 to A♭4 in the song. It has a minimalistic beats which transforms into a marching band stomp during the last lines of the chorus. Besides Sheffield of Rolling Stone, Entertainment Weekly, Time Magazine Complex, Fuse, NPR, and Paste magazine considered the song the best one of 2016. In the annual Village Voice's Pazz & Jop mass critics poll of the year's best in music in 2016, "Formation" was ranked at number 1. Pitchfork and Spin named the song the second best of the year, while NME the sixth. Billboard ranked "Formation" at number 14 on their "100 Best Pop Songs of 2016" list. Prior to its official release as a single, "Formation" debuted at number nine on the US Billboard Bubbling Under Hot 100 Singles in February 2016. The song also debuted at number 11 on the US Hot R&B/Hip-Hop Airplay with 16.3 million audience impressions marking Beyoncé's highest career debut on that chart. Throughout March, the song reached number 33 on the Hot R&B/Hip-Hop Songs due to airplay and further purchase was not disclosed to Billboard by Tidal, the official platform where the song was exclusively made available. After the release of Lemonade, "Formation" set new peak positions on the charts. It debuted at number 10 on the Billboard Hot 100 chart on May 2, 2016, becoming Beyoncé's first top 10 single since "Drunk in Love" in 2014; it is also the singer's highest-debuting single of her career (surpassing "Ring the Alarm" and "Drunk in Love" which both debuted at number 12). During that week, the song debuted at number three on the Digital Songs chart, selling 174,000 downloads. It fell to number 19 on the Hot 100 in its second week. Upon the release of Lemonade, "Formation" also debuted on several international charts. It debuted at number 31 on the UK Singles Chart on May 5, 2016. The same week it also moved to a new peak position of eight on the UK R&B Singles chart. On the ARIA Singles Chart, the song set a peak of 17 on the chart issue dated May 8, 2016. It managed to top the ARIA Urban chart the same week, while the singer's own "Hold Up" was on the second spot. On the French Singles Chart, "Formation" set a peak position of 24 during the week of the album's release. In Canada, the single peaked at number 32 on the Canadian Hot 100 and was certified gold by Music Canada on July 5, 2016 for sales of 40,000 copies. The accompanying music video for "Formation" was directed by Melina Matsoukas and it premiered along with the song on February 6, 2016. It was made available through Tidal as well as an unlisted video on the singer's official YouTube account. The music video for "Formation" was shot in Los Angeles, California, and it features references to Hurricane Katrina, antebellum and Louisiana Creole culture, police brutality, racism and black pride. Interviewed by Alexis Okeowo for The New Yorker, director Melina Matsoukas discussed the music video: "We spoke about the South, New Orleans, her mother's history as well as her father's". As Matsoukas develops an idea for a video, she spends hours browsing online and through art books and magazines, looking for images that resonate. She said: "I treat each video like a thesis project. Stacks of old sources are piled behind her couch: books by Chimamanda Ngozi Adichie, Noam Chomsky, and C. L. R. James; back issues of Wallpaper; math and science textbooks from college". For the "Formation" video, she found ideas in the work of Toni Morrison, Maya Angelou, and Octavia Butler. Matsoukas began to conceive scenes of black history, from slavery through Mardi Gras parades and the Rodney King protests, explaining: "I wanted to show — this is black people. We triumph, we suffer, we're drowning, we're being beaten, we're dancing, we're eating, and we’re still here". She wrote out a treatment and sent it to Beyoncé in the middle of the night. Within hours, the singer had written back to say that she loved it. The music video modifies the song to include spoken interpolations from the New Orleans artist Big Freedia and the YouTube personality Messy Mya, who was murdered in New Orleans in 2010. It begins with Beyoncé lying on top of a Ford Crown Victoria Police Interceptor in a flooded street. During the end, a man can be seen holding a newspaper with Martin Luther King Jr.'s face on it with the title "The Truth". Later on, a young hooded boy dances in front of a line of police officers with their hands up before the video cuts to a graffitied wall with the words "stop shooting us" tagged on it. Dance routines are performed throughout the video by Beyoncé accompanied by back-up dancers. Her daughter Blue Ivy Carter makes a cameo appearance, sporting a natural afro. The music video is narrative based due to the multiple stories it tells with detailed backgrounds to them all. Syreeta McFadden for The Guardian notes that the video depicts archetypal southern black women "in ways that we haven't seen frequently represented in popular art or culture". Following its online release, filmmakers Abteen Bagheri and Chris Black used their Twitter accounts to clarify that "Formation" used footage from That B.E.A.T., their 2013 documentary about the Katrina disaster of New Orleans bounce. Bagheri said he was asked for approval to use the footage, but the request was denied. In a series of tweets, Black and Bagheri claimed they did not give permission to Beyoncé or the music video's director Melina Matsoukas for using their documentary footage. In a statement to Entertainment Weekly, a representative of the singer said: "The documentary footage was used with permission and licensed from the owner of the footage. They were given proper compensation. The footage was provided to us by the filmmaker's production company. The filmmaker is listed in the credits for additional photography direction." Soon after, Bagheri issued a statement to The Washington Post: "Anyone who works in the industry knows that putting out a work is a miracle. There needs to be a unity amongst directors. We need to preserve the sanctity of the craft and champion individual voices. Our work isn't just b-roll for someone else. It just shouldn't be considered, whether or not it's legal. It's a bad precedent to set." The mention of the American restaurant chain Red Lobster in the song's bridge increased sales at the restaurants by 33%, and upon the song's release, the chain was tweeted about over 42,000 times during the first hour and trended for the first time in its history according to Red Lobster spokesperson Erica Ettori. Since the release of the song and the subsequent Super Bowl performance, various publications have released think-pieces about the song, and the current stage of race relations in the United States. Nation of Islam Minister Louis Farrakhan backed the singer during a sermon. Saturday Night Live performed a sketch titled "The Day Beyoncé turned Black" as a result of the release, airing Saturday, February 13. As Lisa Respers France commented in her piece for CNN, "Beyoncé is certainly not the first celebrity to cause a stir by inserting race into her art, but there's a reason why her recent actions are resonating. Quite simply, she is one of those stars of color who -- until now -- has been beyond race for the mainstream audience. That was the basis of a recent "Saturday Night Live" skit that portrayed white fans freaking out about her "blackness," as conveyed by her new "Formation" music video and a Super Bowl halftime performance in which her backup dancers dressed in Black Panther-esque outfits. The halftime show has prompted a number of discussions both pro- and anti-Beyoncé." Beyoncé performed the song as part of a guest appearance during the Super Bowl 50 halftime show, which was headlined by Coldplay at the Levi's Stadium in Santa Clara, California on February 7, 2016. Her performance started after Bruno Mars finished with "Uptown Funk". She wore a black and golden leather outfit and was joined towards the end by Mars again. The duo finished his track and went on performing dance choreographies. Jon Caramanica of The New York Times praised the singer's overall energetic performance, concluding that she outshined Coldplay. He felt that Beyoncé was the only artist capable of promoting new songs at the event. and "walking the cultural tightrope of delivering a song with such potent declarations of black pride on a stage that prefers studied neutrality". A writer of Rolling Stone felt that the performance, with tributes to Michael Jackson and the Black Panthers was "awe-inspiring". "Formation" was the opening number on Beyoncé's The Formation World Tour (2016) with the first performance taking place in Miami at the Marlins Park on April 27, 2016. It was performed with the singer backed by dancers dressed in black sequined leotards and hats with wide brims. "Formation" was also performed as part of a medley of songs from Lemonade at the 2016 MTV Video Music Awards on August 28, 2016, along with "Pray You Catch Me", "Hold Up", "Sorry" and "Don't Hurt Yourself". She finished the performance with "Formation", with her dancers forming the feminist symbol at the end. Rolling Stone's Rob Sheffield commented that Beyoncé "set the whole thing on fire with a 16-minute stomp through the Lemonade songbook", considering the performance as "one of the most blood-chillingly great live performances in award-show history"..
^ "Beyonce Tops Google's Year-End List of Top Searches". ^ a b Kreps, Daniel (February 6, 2016). "Watch Beyonce's Surprise New Video 'Formation'". Rolling Stone. Wenner Media. Retrieved May 1, 2016. ^ a b Reilly, Katie (February 6, 2016). "Download Beyonce's New Single 'Formation' for Free". Time. Retrieved February 6, 2016. ^ Bartleet, Larry (February 6, 2016). "Listen to Beyoncé's new surprise single 'Formation'". NME. Archived from the original on February 7, 2016. Retrieved February 6, 2016. ^ "Beyonce Just Released A New Song And Video -- This Is Not A Drill". MTV. February 6, 2016. Retrieved April 3, 2017. ^ a b c d e f Coscarelli, Joe (February 6, 2016). "Beyoncé Releases Surprise Single 'Formation' Ahead of Super Bowl Performance". The New York Times. The New York Times Company. Retrieved February 6, 2016. ^ "Beyonce's 'Formation' Is A Visual Anthem". NPR. February 8, 2016. Retrieved April 3, 2017. ^ Macpherson, Alex (February 8, 2016). "Beyoncé's Formation review – a rallying cry that couldn't be more timely". The Guardian. Retrieved February 10, 2016. ^ "Key and BPM of Beyoncé - Formation | AudioKeychain". AudioKeychain. Retrieved 2016-02-17. ^ Knowles, Beyoncé. "Beyoncé "Formation" Sheet Music in F Minor (transposable) - Download & Print". Musicnotes.com. Retrieved 2016-06-06. ^ ""Formation" by Beyoncé - Tracks - Pitchfork". ^ Tinsley, Omise'eke Natasha; O'Neill, Caitlin. "Beyonce's 'Formation' Is Activism for African Americans, Women and LGBTQ People". TIME.com. Retrieved 2016-02-09. ^ a b Fallon, Kevin (February 6, 2016). "Beyonce's 'Formation': A Fiery Black Power Anthem and Call to Arms". The Daily Beast. Retrieved February 9, 2016. ^ a b "Our Favorite Songs and Videos Right Now: Beyonce, Kanye West and More". Rolling Stone. Wenner Media. March 2, 2016. Retrieved May 14, 2016. ^ "50 Best Songs of 2016". Rolling Stone. November 30, 2016. Retrieved November 30, 2016. ^ Harris-perry, Melissa (19 December 2016). "Beyoncé" (Vol. 188, Issue 25-26). TIME. pp. 124–128. Retrieved 20 November 2018. ^ Sheffield, Rob (30 November 2016). "50 Best Songs of 2016". ^ "The 100 Best Songs of 2016". ^ Cox, Jamieson. "The Top 10 Best Songs of 2016". TIME.com. ^ "Complex's Best Songs of 2016". www.complex.com. ^ "The 20 Best Songs of 2016 - Fuse". www.fuse.tv. ^ "Top 100 Songs of 2016". ^ Saunders, Hillary. "The 50 Best Songs of 2016". pastemagazine.com. ^ "The 101 Best Songs of 2016". Spin. December 13, 2016. Retrieved December 13, 2016. ^ "NME's Songs of the Year 2016". NME. November 26, 2016. Retrieved December 13, 2016. ^ Cantor, Brian (February 23, 2016). "Andra Day, Alessia Cara, Ty Dolla $ign, Beyonce, Zendaya score Bubbling Under Hot 100 Debuts". Headline Planet. Retrieved May 11, 2016. ^ Mendizabal, Amaya (February 18, 2016). "Beyonce Earns Highest R&B/Hip-Hop Airplay Chart Debut With 'Formation'". BIllboard. Retrieved May 11, 2016. ^ a b Trust, Gary (May 2, 2016). "Desiigner Holds Off Drake Atop Hot 100, Prince & Beyonce Hit Top 10". Billboard. Retrieved May 2, 2016. ^ a b "Official Singles Chart Top 100". Official Charts Company. Retrieved April 29, 2016. ^ a b "Official R&B Singles Chart Top 40". Official Charts Company. Retrieved May 6, 2016. ^ "ARIA Urban Singles Chart" (PDF). May 9, 2016. Retrieved May 11, 2016. 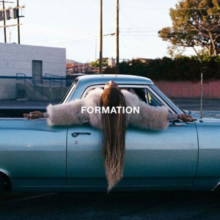 ^ a b "Canadian single certifications – Beyonce – Formation". Music Canada. Retrieved July 10, 2016. ^ Beck, Laura (February 6, 2016). "Here Are the Best Lyrics From Beyoncé's Perfect New Song, "Formation"". Cosmopolitan. Retrieved February 6, 2016. ^ "Beyoncé Shoots Secret Video in New Orleans". Rap-Up. December 22, 2015. Retrieved February 7, 2016. ^ a b Sisavat, Monica (February 6, 2016). "9 Celebrity Reactions That Perfectly Describe How You Felt When Beyoncé Dropped "Formation"". Pop Sugar. Retrieved February 7, 2016. ^ "The Provocateur Behind Beyoncé, Rihanna, and Issa Rae". The New Yorker. Retrieved February 28, 2017. ^ "Beyoncé samples Messy Mya on 'Formation'". YouTube. ^ Stone, Natalie (February 6, 2016). "Beyonce Drops New 'Formation' Single, Music Video". Billboard. Retrieved February 6, 2016. ^ Helman, Peter (February 6, 2016). "Beyoncé – "Formation" Video". Stereogum. Retrieved May 1, 2016. ^ McFadden, Sureeta (February 8, 2016). "Beyoncé's Formation reclaims black America's narrative from the margins". The Guardian. Retrieved February 9, 2016. ^ "Beyoncé used New Orleans documentary footage 'with permission' in new 'Formation' video: rep". Entertainment Weekly. February 7, 2016. Retrieved February 7, 2016. ^ Contrera, Jessica (February 7, 2016). "Before Super Bowl halftime show, Beyoncé responds to accusations of plagiarism". Washington Post. ^ Riley, Charles. "Red Lobster: Sales spike 33% after Beyoncé endorsement". ^ Hansen, Dale (February 23, 2016). "Responses to Beyoncé's Shows How Far We Still Have to Go". The Huffington Post. Retrieved February 26, 2016. ^ a b France Respers, Lisa (February 23, 2016). "Why the Beyoncé controversy is bigger than you think". CNN. Retrieved February 26, 2016. ^ "Beyoncé Offered Protection From Nation of Islam Amid Police Union Boycotts - Billboard". Billboard. ^ "'SNL' Takes on Beyonce's 'Formation' in Hilarious Sketch About 'The Day Beyonce Turned Black': Watch". Us Weekly. ^ "Beyoncé On Why She Performed 'Formation' At The Super Bowl". The Huffington Post. Retrieved February 9, 2016. ^ Abad-Santos, Alex (February 6, 2016). "Listen: Beyoncé's new song 'Formation'". Vox. Retrieved February 7, 2016. ^ Caramanica, Jon (February 7, 2016). "Review: It's Coldplay, Starring Beyoncé, at Super Bowl Halftime Show". The New York Times. The New York Times Company. Retrieved May 12, 2016. ^ "Beyoncé Kicks Off 'Formation' Tour in Miami, Jay Z Shows Support But Doesn't Perform". ET. Retrieved April 30, 2016. ^ Randel, Becky (April 27, 2016). "Beyonce Pays Tribute to Prince, Dedicates 'Halo' to Jay Z as 'Formation World Tour' Kicks Off in Miami". Billboard. Prometheus Global Media. Retrieved May 14, 2016. ^ Sheffield, Rob (August 29, 2016). "How Beyonce Demolished the 2016 Video Music Awards: Middle Fingers Up". Rolling Stone. Retrieved October 8, 2016. ^ "Beyonce Album Credits". Beyonce.com. Retrieved May 12, 2016. ^ "Australian-charts.com – Beyoncé – Formation". ARIA Top 50 Singles. Retrieved May 7, 2016. ^ a b "Ultratop.be – Beyoncé – Formation" (in Dutch). Ultratip. Retrieved May 21, 2016. ^ "Ultratop.be – Beyoncé – Formation" (in French). Ultratip. Retrieved May 18, 2016. ^ "Beyonce Chart History (Canadian Hot 100)". Billboard. Retrieved April 3, 2016. ^ "Denmark Digital Songs". Billboard. May 2, 2016. Retrieved April 30, 2016. ^ "Euro Digital Songs". Billboard. May 2, 2016. Retrieved April 30, 2016. ^ "Beyoncé: Formation" (in Finnish). Musiikkituottajat – IFPI Finland. Retrieved May 2, 2016. ^ "Lescharts.com – Beyoncé – Formation" (in French). Les classement single. Retrieved April 29, 2016. ^ "Offiziellecharts.de – Beyoncé – Formation". GfK Entertainment Charts. Retrieved April 29, 2016. ^ "Greece Digital Songs". Billboard. May 2, 2016. Retrieved April 30, 2016. ^ "Archívum – Slágerlisták – MAHASZ" (in Hungarian). Single (track) Top 40 lista. Magyar Hanglemezkiadók Szövetsége. Retrieved May 6, 2016. ^ "HBeyonce Chart History". RÚV. Retrieved 24 May 2017. ^ "Chart Track: Week 17, 2016". Irish Singles Chart. Retrieved April 30, 2016. ^ "Netherlands Digital Songs". Billboard. May 2, 2016. Retrieved April 30, 2016. ^ "New Zealand Digital Songs". Billboard. May 2, 2016. Retrieved April 30, 2016. ^ "Norway Digital Songs". Billboard. May 2, 2016. Retrieved April 30, 2016. ^ "Official Scottish Singles Sales Chart Top 100". Official Charts Company. Retrieved April 29, 2016. ^ "Spanishcharts.com – Beyoncé – Formation" Canciones Top 50. Retrieved April 11, 2017. ^ "Sweden Digital Songs". Billboard. May 2, 2016. Retrieved April 30, 2016. ^ "Veckolista Heatseeker – Vecka 18, 6 maj 2016" (in Swedish). Sverigetopplistan. Retrieved February 11, 2019. ^ "Beyoncé Chart History (Hot 100)". Billboard. Retrieved May 2, 2016. ^ "Beyonce Chart History (Hot R&B/Hip-Hop Songs)". Billboard. Retrieved March 19, 2016. ^ "Beyonce Chart History (Dance Club Songs)". Billboard. Retrieved May 11, 2016. ^ "Beyonce Chart History (Rhythmic)". Billboard. Retrieved March 19, 2016. ^ "ARIA Top 50 Urban Singles 2016". Australian Recording Industry Association. Retrieved January 6, 2017. ^ "Jaaroverzichten 2016" (in Dutch). Ultratop. Retrieved December 27, 2016. ^ "ARIA URBAN SINGLES CHART". Australian Recording Industry Association. July 31, 2016. Retrieved July 30, 2016. ^ "American single certifications – Beyonce – Formation". Recording Industry Association of America. Retrieved May 17, 2018. If necessary, click Advanced, then click Format, then select Single, then click SEARCH. ^ "BBC – Radio 1 – Playlist". BBC Radio 1. Archived from the original on February 21, 2016. Retrieved February 21, 2016.